This post first appeared on the Scholastic Top Teaching blog. Earlier this week, we announced that James Patterson will donate $1.25 million to school libraries this year in the first-ever partnership of its kind! He's partnering with Scholastic Reading Club, and we'll be matching each dollar with Reading Club “Bonus Points,” which teachers can use to acquire books and other materials for their classrooms, at every school that receives an award. School libraries can be nominated for a donation here:www.scholastic.com/pattersonpartnership. In celebration of school libraries, we went straight to the source and asked top librarians and academics about why saving school libraries is so important. 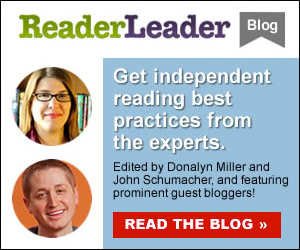 Today, we speak with speak with "Mr. Schu Reads" blogger and school librarian John Schumacher. Q | What makes school libraries so important for kids? John Schumacher | School libraries change lives. A school library is a safe place for children to explore, to create, to share knowledge, to take risks and to connect with others. The School Library Month planning committee adapted the Declaration to the Right to Libraries for school libraries. In my opinion, it beautifully and succinctly sums up why an effective school library program is so important for kids. Powerful stuff, right? [There are many..] ways to celebrate School Library Month in April. Q | If you could say one thing to the school librarians of the world, what would it be? JS | Dear School Librarians of the World: Tell your library’s story. If you don’t, who will? Q | Do you have time to read for pleasure and if so, what sorts of books do you read? JS | Oh, yes! Let’s take a look at the books I’m raving about right now. JS | Cece Bell is on my mind today. Have you seen the thank-you video she posted for the 2015 Newbery Committee? I’ve watched it five times today. It fills my heart with joy and makes me feel proud to be an ambassador and advocate for graphic novels and their creators.